Many who have attempted to pack and transport their belongings on their own, have realized that it is one of the most strenuous and tiresome activities that they have ever undertaken. We agree – moving residence has too many issues that need your attention; finding a house, schools for the children, utility and in-city transport, shopping, etc. The last thing you would want to devote your already depleted energy levels to is packing your belongings, arranging them to be transported to your new home, and unpacking and putting your house in order. Think about engaging a professional Port Macquarie to Hobart removalists expert; think about engaging Roadways Furniture Removals, the best removalists people in the business. The process is started simply with a phone call. One of our client representatives will be able to promptly to assess your requirements, suggest some tips and offer you a comprehensive estimate that is as easy to understand. Expertise: Roadways has made furniture removals and interstate re-locations into a fine art. We know virtually everything that there is to know about interstate removals in Australia. Our professional expertise is reflected in the confidence you encounter with every interaction that you have with us. Packing is undertaken by packers with years of experience, using the best materials. Coverage: If there is a destination in Australia, you can be sure that it is on the Roadways network map. We have offices and Roadways partners all over Australia that leaves us unfazed even for the remotest of locations. You can be sure that we’ll provide you the best of services that is the cornerstone of our matchless reputation. Fleet: Roadways has a dedicated network of vehicles in a variety of sizes to accommodate consignments of virtually every magnitude. We can undertake the transport of your car or motorbike should you feel disinclined to drive all the way to your new destination. We have trucks moving between popular destinations all the time on a regular schedule – should you have a small consignment to be moved and are looking for Port Macquarie to Hobart Removals, you can take advantage of our backloading services which allows your load to be carried in a vacant space of a truck instead of you having to hire a dedicated service. 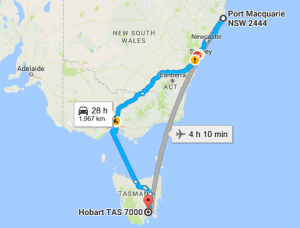 If you need reliable Port Macquarie to Hobart removalists, Roadways Removals is ready to get the whole process on the way today!